Bournemouth Borough Council: Darryl Howells has won an appeal against a decision to refuse planning permission for the demolition of a building formerly used as a doctor’s surgery and its replacement with a block of nine flats. 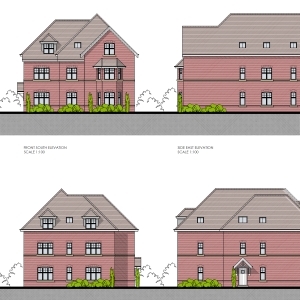 The application was refused by Bournemouth Borough Council on the loss of a non-heritage building and lack of acceptable living conditions for residents and the provision of external amenity space. The scheme was designed by Anders Roberts Cheer. Having the application refused, the applicant Holton Homes instructed Darryl to appeal the decision to the Planning Inspectorate. Prior to doing so, and as the applicant has 6 months to appeal the decision, Darryl suggested the strategy of first, applying under Part 11 of the General Permitted Development Order first to demolish the building. Doing so created a material planning consideration to place before the Inspector as justification for the loss of the building (and to overcome the Council’s first reason for refusal). Darryl then appealed the decision and using positively constructed arguments, convinced the Planning Inspector to allow the appeal. In those arguments, Darryl reminded the Inspector that the Council had not been designated as a building on its local list of important buildings. The Local List does not afford each building with statutory protected status such as a Listed Building, but does afford it some protection as a heritage of local importance). In this case, the building had been designated a heritage asset in the emerging Boscombe and Pokesdown Neighbourhood Plan; however as the Neighbourhood Plan had not reached an advanced stage of adoption its weighting as a material planning consideration was limited. The Inspector accepted this point raised by Darryl, and that of the Council had previously authorised the demolition of the building under the Part 11 application, so that fall-back decision was afforded “significant weight”. The second reason for refusal referred to the lack of amenity space both internally and externally. The Council had refused the scheme as the sizes of the flats had failed to accord with the Government’s published Technical Housing Space Standards. In allowing the appeal, the Inspector reminded the Council “that the Written Ministerial Statement of 25 March 2015 makes it clear that such standards can only be applied where there is a relevant current local plan policy. In this case, there is no relevant current policy and consequently this is not a matter which carries any significant weight against the proposal. In my judgement, the floorspace of the proposed flats, which would range from 54 to 62 m2, would provide occupants with adequate space to live comfortably”. In assessing the external amenity space that was limited, the Inspector concluded that “Whilst it may be preferable for each of the units to have access to a garden or balcony, I have not been directed to any policies which require such provision. I also note that it is not the norm for flatted schemes in this location”. If you have been refused planning permission, please contact a member of the Pure Town Planning team, to consider and advise of a planning strategy that could overcome the Council’s objection and subsequently allow your development to proceed.